Se battant pour son indépendance, Khadija est une Marocaine divorcée qui défie sa famille et travaille comme camérawoman pour des mariages. de Karima Zoubir, Maroc, 2012, couleur, HDcam, 59′, Doc. Moroccan divorcee Khadija works as a camerawoman at weddings in Casablanca. Her mother and brother strongly disagree with her choice of occupation and want her to quit. They’re already ashamed enough that Khadija, the mother of an 11-year old son, is living back at home. But Khadija is the breadwinner in the family and she won’t back down. She’s sometimes out for several days in a row at parties and weddings, working until the early morning. 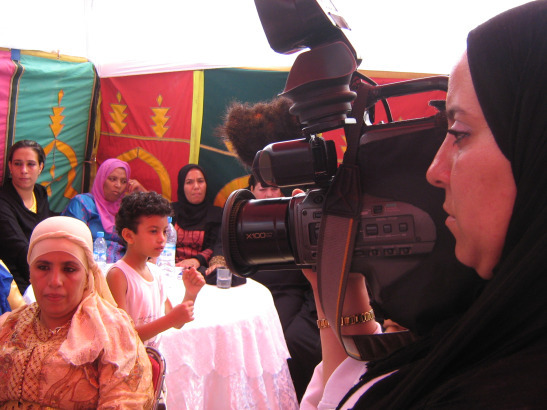 Although a working woman is a taboo in the conservative section of Moroccan society, the demand for female camera operators is big, because families prefer having a woman film their daughters at their wedding. The fairytale world of the average wedding party is a sharp contrast to the reality of divorces and forced marriages. But traditional values are under pressure even in Morocco, with women like Khadija demanding freedom and independence, while also wanting to honor the wishes of their families. Together with her best friend Bouchra, also a divorcee, Khadija talks candidly about the other side of marriage. Alternately joyful and sad, the women wonder aloud why they’re still not equal to men. Woman with a Camera follows the life of an illiterate, religiously-conservative woman determined to work as wedding videographer in Casablanca despite overwhelming resistance from her family and the society around her. Arab women, especially in Morocco, live in a society ruled by men, where the legitimate desire of each woman to explore and be independent, is often threatened by tradition as well as a very conservative interpretation of Islam. Paradoxically, because of the recent surge in conservatism, female wedding videographers are more in demand than ever because families are more and more concerned about who films their daughters and how. The film will follow how being a wedding videographer is changing the life of Khadija Harrad, a single, divorced woman, whose family wants her to remarry and stop working. The increasing conservatism of some Moroccan families has enabled this woman to gain a level of independence otherwise unthinkable outside of her home. The film will show how the camera plays a liberating role, all the while placing this woman in a daily struggle over women’s position in Moroccan society. The independence that she experiences is relative. Khadija Harrad, is a part of the new generation of young, divorced women in Morocco. Mother of an 11 year old, she faces daily harassment from her parents and her brother, who are all ashamed that she is divorced. Her brother wants her to stop her work as a wedding videographer, despite the fact she earns the most money in the family, because the work requires her to come home late at night. He doesn’t want her behavior ruining his reputation in the neighborhood. Her mother wants her to remarry as soon as possible, because she is concerned about the chances of Harrad’s younger sister ever marrying when she has a divorced older sister. As the wedding season in Casablanca unfolds, Woman with a Camera will follow Khadija as she moves back and forth from her conflictual home life to the hopeful, fantasy world of the wedding days she films. It is a world of great beauty and sweet dreams in the videos she films, but in reality the weddings are an expression of the struggles women face in contemporary Morocco to combat exclusion and oppression and somehow move beyond them.